Mary Lee posted an image this morning of a castle, and I imagined it a flat place, full of stereotypes. the fool juggling lives before the fickle king. I reviewed Ralph Fletcher’s Pyrotechnics on the Page for Middleweb. Fletcher is engaging as a writer, of course, but these techniques for sparking creativity and playfulness in young writers is worth your time. Mary Lee had an interesting video up this morning to inspire poetry as part of her month of sharing resources from Wikimedia Commons. The video (above) is of a revolving sushi bar, and that got me thinking a bit about how the range of choices might actually be limiting. on a small blue plate. from the small moving dish. and slinks off to bed. Our Western Massachusetts Writing Project is nearing a 20th year anniversary, and I have been tasked with pulling together a video montage to show at our celebration event coming up in a few weeks. One of my colleagues had collected some quotes from folks at a recent event about how they feel about WMWP, and I decided to use some of those with HaikuDeck, and then later, I will move the slides into the larger video. 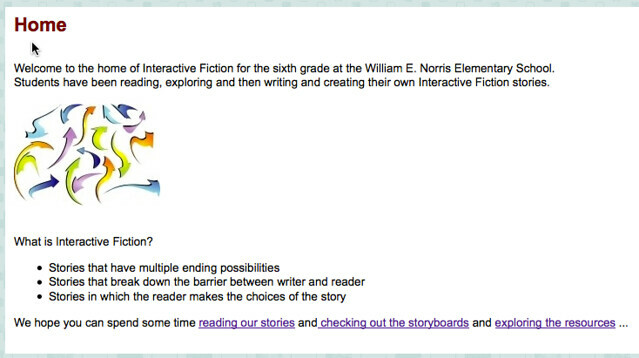 Please visit our space and read some of the stories created by sixth graders. Follow the branches and try not to get too lost! PS — you can follow our work over the past few weeks with this link, too. 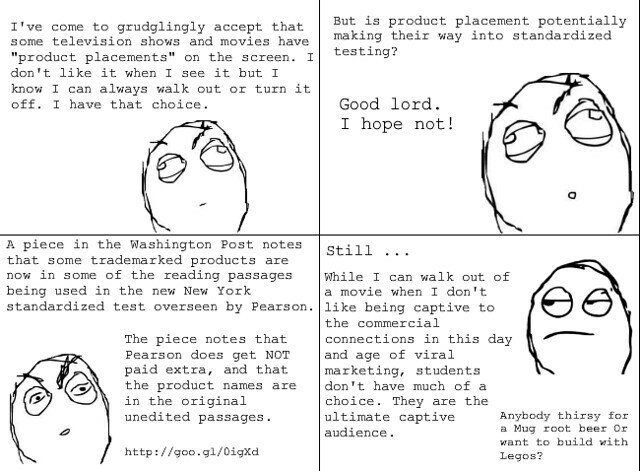 I wrote this comic after reading a piece at the Washington Post about the creeping (creepy) influence of trademarked products into standardized testing. The article notes that Pearson does not appear to have gotten paid for including the names and trademarks of commercial products, and its inquiry found that the products were references in the original texts used for the assessment .. yet how can we NOT wonder about the influence? We have to. Testing situations have to be above reproach when it comes to our kids. I am going to try my hand at being part of Mozilla’s Teach the Web MOOC. The project seeks to help folks explore the ways to remix and rework and hack the web with various tools (some of which I have used before) in ways to put more agency in the hands of users. How can I do more to make the Web work for me? How can I envision these tools in the classroom with my students? Is the MOOC format a workable model for me? How can I connect with a larger community of educators and others with similar mindsets? I’ll see how it goes. You come, too. We’ll learn together. Thank you, NCTE, for articulating a strong position on using computers to assess student writing in standardized testing. The National Council of Teachers of English published a position statement this past week that strongly denounces the shift towards having computers and software programs assess student writing, particularly in relation to the coming Common Core assessments that so many of our states are now part of. The paper then goes on to cite alternative ways to assess student writing, including the well-researched method of portfolios. Whether PARCC and Smarter Balance folks are listening, or care to listen, is a whole other matter. If they need any help, the writers of the position paper helpfully provide a long list of annotated articles on the topic. PS — Thanks to Troy Hicks for sharing the link via Twitter. Troy is one of the authors of the position paper.